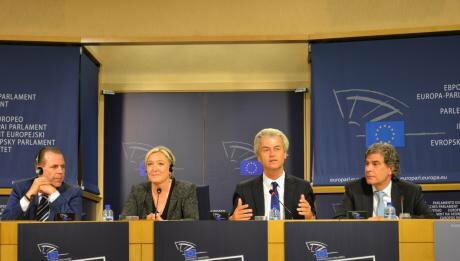 Marine Le Pen and Geert Wilders announced the formation of the new Europe of Nations and Freedoms group in the European Parliament today. A financial success? Sure. A political success? Unlikely. The main newsworthy aspect of today’s launch of the far right political group Europe of Nations and Freedom (ENF in English, ENL in French) is that this time it seems to be actually happening. In the run-up to the European elections of May 2014 Le Pen and Wilders claimed for months that they had the members, but in the end had to admit that no one had joined their original ‘core group’ of five, i.e. FN, PVV, Austrian Freedom Party (FPÖ), Belgian Flemish Block (VB) from Belgium, and Northern League (LN) from Italy. They announced they would have a group “very soon,” which turned out to be over a year. As expected, le Pen and Wilders had to build their new group on the services of renegades of parties, rather than the parties themselves. Janice Atkinson was considered too corrupt for the United Kingdom Independence Party (UKIP) and their Europe for Freedom and Direct Democracy (EFDD) group, and will claim her expenses from the ENF in the future, while the two Polish members, Michal Marusik and Stanisław Żółtek, are hailed as “the new moderate political leadership” of the Polish Congress for a New Right (KNP), a leader-centric party that recently ousted its leader Janusz Korwin-Mikke, its only popular politician. Hardly the basis of “a real politically coherent EU-critical group”, as FPÖ General Secretary and European Parliament (EP) faction leader Harald Vilimsky made it out to be. 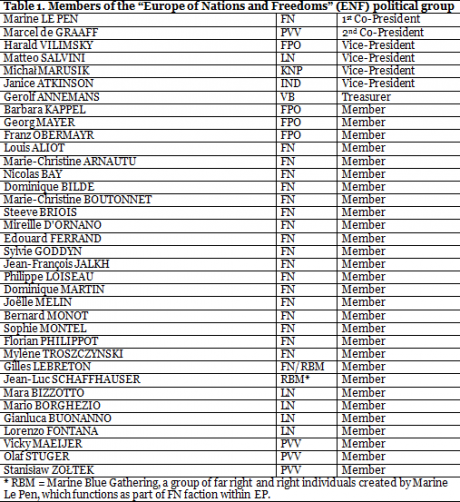 Click to enlarge.According to today’s press communiqué of the Directorate General of the President of the European Parliament the ENF group has 36 MEPs from 7 EU member states. More than half (19) are from Le Pen’s FN, which dominates the far right within the EP, 5 come from the Italian LN, 4 each from the FPÖ and PVV, 2 from the KNP, 1 from VB, and 1 is independent. Ironically, at this moment the ENF has fewer MEPs than the five ‘core parties’ had on the night of the European elections, as FN directly lost one MEP, Joëlle Bergeron, and recently expelled its founder, and Marine’s father, Jean-Marie Le Pen. In solidarity, his long-time fellow-MEP Bruno Gollnisch will also stay out of the ENF. That leaves one missing FN MEP, Aymeric Chauprade, who is currently believed to be in Fiji. Chauprade was supposed to lead the new group, but fell out of favor with the Marine Le Pen in-crowd, and is now largely isolated (although he will probably join ENF). Let’s be absolutely clear, the ENF is a financial success, but a political failure. It is estimated that the new political group will be able to get its hands on up to €17.5 million in the next four years. This money is crucial for parties that are allegedly so cash-strapped that they have to borrow money from Putin’s cronies in Russia. It will also create the necessary paid positions to distribute the patronage that keeps any party going – particularly for the FN, which has few MPs in the French parliament, as a consequence of the country’s highly disproportional electoral system. While it will also give the parties a slightly larger presence within the EP, notably through some more speaking time, the ENF will be as isolated as the EFDD. Politically the ENF is without any doubt a failure. Even one year after the European elections, with the British and Swedish elections over, Le Pen and Wilders have not been able to convince any of the preferred parties to join. The Czech Party of Free Citizens (Svobodní), Lithuanian Order and Justice (TT) and the Sweden Democrats (SD) remain within EFDD, while the Danish People’s Party (DF) and the Finns Party (PS) enjoy the respectable cover of the European Conservatives and Reformists (ECR). Even the Polish KNP is divided over the EFDD, ENF and Non Inscrits (non-attached, NI). Moreover, the party already had an uncertain future with its former leader Korwin-Mikke and seems destined for political oblivion without him. It is delightfully ironic that the creation of the anti-EU ENF was a perfect example of everything ENF politicians claim to despise about the EU. They bent the rules to be able to eat from the much-maligned EU trough and they did so by recruiting the stereotypical MEP, whose assistant was caught inflating her expenses claim. An opportunism shared by all political groups in the EU; from the centre-right European People’s Party (EPP), which continue to support the self-proclaimed “illiberal democrat” Hungarian premier Viktor Orbán, to the Socialists & Democrats (S&D), which just re-elected the corrupt Bulgarian ex-premier Sergei Stanichev as president, and from the Europhile Alliance of Liberals and Democrats (ALDE), which harbors the corrupt Bulgarian Movement for Rights and Freedom (MRF), to the Eurosceptic ECR, which accepted the far right DF into its midst.